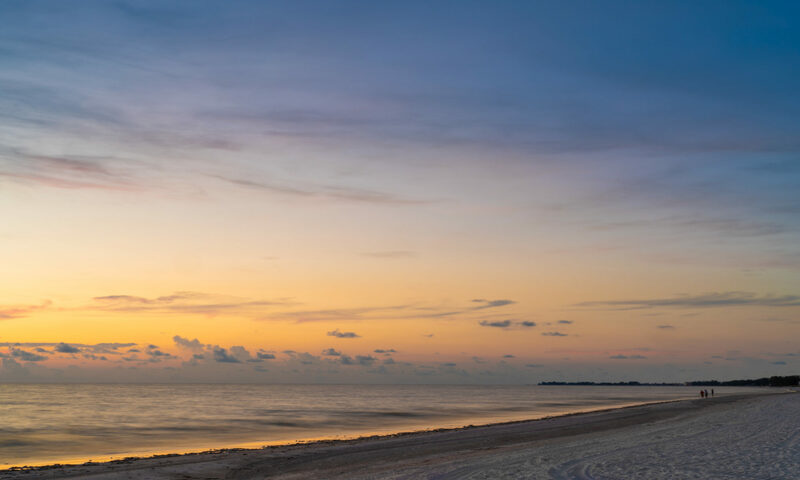 The last rays of the day before dusk at Fort DeSoto park in St Petersburg Florida. Everything was idyllic on this evening and I thought this is a moment I want to remember. Of course I was busy taking pictures, but I have this souvenir. For me, just being there to take the picture was enjoyment enough. This is one in a series of broken down piers in Bradenton Beach. Actually, there are big barriers in front to keep people off, but I’m sure that doesn’t apply to fishermen or photographers, right? In any case, this is one of the last shots you’ll see because they are deconstructing and removing them all. I think that’s kind of sad because I feel they add character, but that’s just me. I’m sure the beach will look even more pristine once they’re gone. In general, I’m all for piers, they give us all a chance to go out over the water with very little effort. And of course I like taking pictures of them at sunset. I guess I’ll just have to focus on something else. This is the view from Bell Rock in Sedona. I was here over the New Years and the weather was spectacular, cool in the evenings and warm in the day. Now I suspect with summer approaching its much much warmer. These rock formations are so unique that it’s all you can do to pull over and stare for a half hour. It’s not something that’s too common here on Earth, Mars perhaps, but not here. I lingered here so long that when the sun fell below the rocks it got dark very quickly and so I ended up using the light on my iPhone to make my way back to the parking lot. Note to self, bring a flashlight next time. I’m posting this to remind myself to get outside after it stops raining. That’s when we get great light and as everyone knows, photographers love unusual shades and hues of light. Right after a storm is one of those times. In any case, this was taken in the morning after an evening of rain and with any luck I’ll get out again today or tomorrow morning for some similar shots. In the meantime, have a great day everyone. This is taken from the banks of the East River on the Manhattan side of the Brooklyn Bridge. A group of us from the Arcanum showed up before dawn to capture the sunrise but there were plenty of other subjects at hand as well. These old concrete pilings are probably leftover from some pier or docks in ages past. How cool would it be to travel back in time and see what was here a century ago. Until that time it will just have to be a part of my imagination and the help of a photo or two. It’s warm and humid here in central Florida and this evening the clouds were heavy and thick. So I headed over to the Skyway Bridge to capture this. As I was here some dolphins swam by, ships passed under the bridge, and pelicans looked for scraps from the fishermen. All in all, just another lazy Sunday evening. A roadside grove in central Florida. As we drove by we noticed how the sun illuminated the tops of these grasses from behind. They looked ethereal swaying in the wind as I crouched low to include the tall poplar trees in the frame. The is a common sight for central Florida, nonetheless we just happen to see is at the right moment and decided to stop long enough to preserve it in a photo. The interstate highway in Florida is long stretches of boring punctuated with brief glimpses of amazing. Interstate 75 is inland, protected from the hurricanes, but when it crosses marshes or rivers you get a quick glimpse of the landscape. This bridge stretches a mile over the Manatee River near my home. There are houses that line the river but I managed to find a vantage to take this without walking through someone’s backyard. Can you imagine waking up to this each morning? Fulton Station is in downtown New York. There are several entrances and this seems newer than the rest. While on a photowalk we were suppose to meet some people near here and while we walked inside to get a few shots of the architecture. Just one of a million locations to shoot in Manhattan. Last Friday, Battery Park in lower Manhattan was the place to be as the week ended with a warm breeze and spectacular sunset. I was busy clicking away when this couple came up and asked to take their picture and email it later. When I got home I realized that I had them out of focus. Arrrrg!!! Lucky enough I had taken this shot with them in it a few minutes earlier. It was an amateur mistake, but hopefully they can take this image as a memory of that moment together during one of the most romantic sunsets of the season.